Although virtually no flagship from a major brand comes with just two cameras nowadays, one of the three upcoming Galaxy S10 models is expected to feature a single camera on each side. On the other hand, the top-of-the-line variant apparently has a total of five cameras. In the end, this might be just another partially accurate rumor. Although the Samsung Galaxy S10 is expected to be unveiled in the first part of 2019, no less than three different variants were already certified in China. The strangest part is that the base model might feature a single camera on each side, something very unusual for a flagship in 2018, not to mention for the year that comes after it. 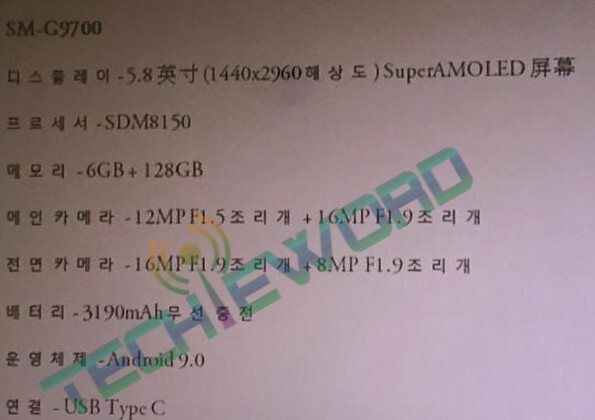 The specs sheet that recently surfaced on Weibo includes the following highlights: Qualcomm Snapdragon 8150 processor, 5.8-inch Super AMOLED display with 1,440 x 2,960 pixels, 6 GB RAM, 128 GB internal storage, 12 MP + 16 MP main camera, 16 MP + 8 MP selfie shooter, 3,190 mAh battery with USB Type-C charging, as well as Android 9.0 Pie. While the above sound quite right for an upcoming flagship device, SamMobile bumped into some rather unbelievable rumors that claim a single camera on each side for the SM-G970 model. Since the Weibo leaked image involves the SM-G9700 model, it would not be surprising for both of them to be inaccurate. Previously, we heard that the SM-G975 would come with a total of five cameras and a 6.44-inch display. The third model would be the SM-G973, which will probably have a single selfie shooter, a dual camera setup on the back, and most likely a smaller display as well. All are supposed to come out in the first quarter of 2019. What do you hope to see included in the upcoming Samsung Galaxy S10 to make it worth your hard-earned cash? Let us know in the comments.